6:30 p.m. - FREE zine-making workshop with Chicago Zine Fest! 7:30 p.m. - Open mic sign-up begins. WHERE: Co-Prosperity Sphere, 3219-21 S. Morgan St. in Bridgeport. Coming from I-90/94, get off at the 31st St exit. If you're coming via CTA, you can take the Orange Line to Halsted and then hop on the Halsted bus, #8, south to 31st St or take the Red Line to 35th St, then take the 35th St. bus, #35, to Morgan Street. THEME: ARTIFACT - As we move through this life, we all create things that convey who we are. 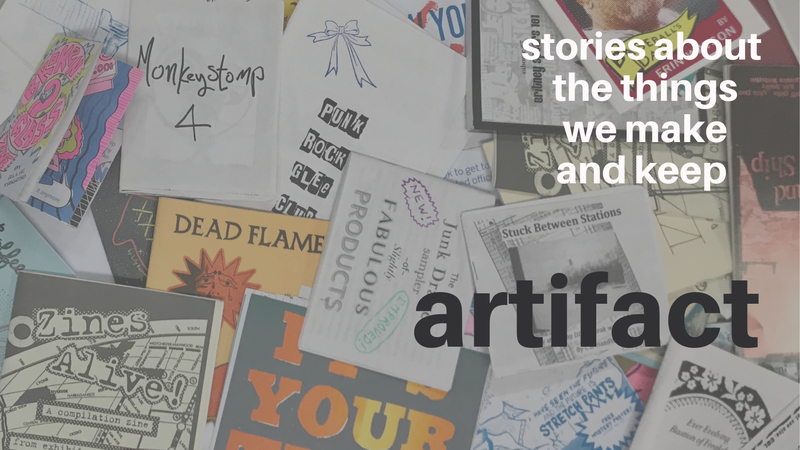 This month, we're sharing stories taken from the pages of zines* crafted by local self-publishers about the things we make, the things we keep, and the things that help define us. We're excited to team up with Chicago Zine Fest to commemorate the annual festival's 10th anniversary of celebrating small press and independent publishers! Please join us before the show for a fun zinemaking workshop geared toward zine newbies and veterans alike. All supplies will be provided; just bring your ideas! * A zine (rhymes with "bean") is a self-published work that is usually reproduced via photocopier and has a small circulation. * Zine doyenne and independent bookseller LIZ MASON! * Dedicated zinemaker and marathon runner DAN KITTAKA! * Inventive artist and self-publisher HEATHER ANACKER! Co-hosted and co-produced by ANDREW MARIKIS and CYNTHIA E. HANIFIN! We will be collecting donations at the show for 826CHI, a nonprofit creative writing, tutoring, and publishing center dedicated to amplifying the voices of Chicago youth. If you have a true story you'd like to tell about something you've created (or anything else you want to share with our audience), sign up for our Open Mic! THE DRILL: There are two or three open mic slots available. Open mic participants will have eight minutes to tell a story - it doesn't have to be on theme, just a story! Open mic sign-up starts at 7:30pm with host Andrew Marikis. TICKETS: $5 presale tickets, $10 at the door. Cash bar. BYOFood HIGHLY encouraged. To find ticket links and other details, go to www.storyclubchicago.com or the Facebook event page. If you would like to schedule an interview, please contact the founder of Story Club, Dana Norris, at dana@storyclubchicago.com or host and co-producer Andrew Marikis at Andrew@storyclubchicago.com.